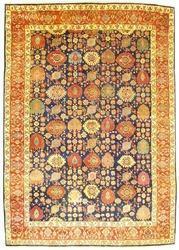 Since time immemorial the enduring and eternal art of pure silk carpets & rugs have captivated the imagination of mankind. The lushness, luxury and the mystic of hand-made, hand-knotted silk carpets have epitomized our love for this ageless art. Description : These sarouk handcrafted carpets are immensely used in countless luxurious hotels, offices, party halls to enhance their decor in an stylish and enthralling way.